"But he giveth more grace. Wherefore he saith, God resisteth the proud, but giveth grace unto the humble" (James 4:6). This is truly a graceful and beautiful Christian cross necklace and a way to share your faith and start conversations with people about the Lord Jesus. An oxidized stamped cross is the focal-point of this uniquely fashioned cross disc Christian necklace from Apples of Gold Jewelry. The cross is studded with cubic zirconia stones (CZs) and crafted in pure .925 sterling silver. Necklace measures 16" with 2" extension, so you can adjust it from 16" - 18" at will. The disc measures 15mm in size (just over 1/2" at 0.59 inches). 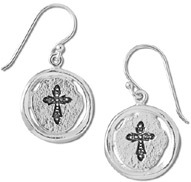 Our cross disc necklace is also available with matching earrings (shown below). We guarantee our Stamped Christian Cross Disc Necklace, Sterling Silver to be high quality, authentic jewelry, as described above.